Harvesting sunflower seeds for snacks and cooking, bird feeders, or next season's garden is quite easy. 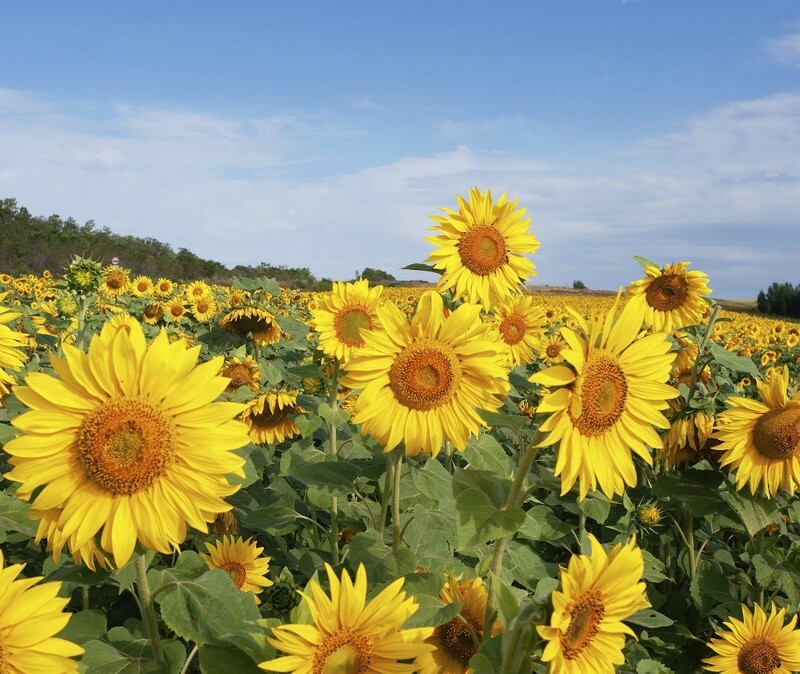 This is a guide about harvesting sunflower seeds. How do you harvest sunflower plants and seeds? Step 1: Start harvesting sunflower seeds around the third week of September. A sure sign that it is time to harvest the seeds is when the back of the sunflower turns brown and the head starts to curl. The petals will fall off and the seeds will have black stripes on them. Step 2: Early harvest of seeds is accomplished with some muscle and utilizing the oven to dry the sunflower seeds. Remove the heads from the sunflower when the back of the flower is a light yellow color. Use a towel to rub the seeds into a bowl. Soak the seeds overnight in a solution of a quarter cup salt mixed with one quart of water. Spread seeds on a baking sheet and roast in the oven at 200 degrees for three hours. Step 3: Sunflower seeds can also be dried while still on the head. Cut the heads off the plant. Use the sunflower stem to hang the heads in a garage or shed. Place a bag over the heads to catch seeds as they fall. To prevent mold and encourage drying, poke holes in the bag to keep the seeds ventilated. Good luck. I have tried many times to grow sunflowers for the seeds. How do you harvest them and dry them? I never have any success. I have grown some sunflowers for the 1st time this year. They are taking a long time-but are 6 ft or so tall & have many green heads on each plant. Tops are medium sized and are just getting golden in the centers, but petals are still green. Can you still use the seeds from a sun flower if you take the seeds out of the flower before they dry or change color? Yes, mam! Dry them in the house. But, I've also just stuck them back in the ground and had great results. What's the most practical method to harvest sunflower seeds? As pedals dry out, I cut off the heads leaving enough stem to hang in groups to dry or finish maturing. After a month or so, the seeds are "thumbed out" of the head leaving behind flying seeds and sore thumbs. Short of machinery (this is just a garden border harvest) is there a simpler and less painful way to save the winter feed for the birds? How do you get the seeds out of sunflower heads and are they edible?